LG released the LG G7 ThinQ. The new G7 ThinQ is the new flagship of LG, and better than all the other phones out there. But is it better than the LG G6? Here is everything about the LG G7 ThinQ vs LG G6. The all-new LG G7 ThinQ is definitely the new talk of the town. This premium flagship has all the features a phone should have, and even more. Though the phone market at the moment is crowded with many flagships out there, the LG G7 ThinQ is seen as a well-needed flagship for these times. But, is the LG G7 ThinQ a true upgrade? And, is it better than the LG G6? What makes both the phones this different? Well, here is everything you need to know about the LG G7 ThinQ vs LG G6. The display is definitely a key feature in the LG G7 ThinQ. The ThinQ features a 6.1-inch display panel and has a screen resolution of 1440 x 3120 pixels. The device aspect ratio is 19.5:9. Another feature that LG has been boasting about is the brightness level that can reach even up to 1,000 nits even in direct sunlight. Another important aspect is the notch in the panel. Though many Android phones have begun to sport this notch, the LG G7 ThinQ has the option to hide out this notch by blacking out the top edge of the phone in itself. When coming to the G6, the G6 sports a 5.7-inch display panel, with an aspect ratio of 2:1. When compared to the ThinQ’s display, the display falls way short. The panel is small and cannot reach the maximum display of the LG G7 ThinQ. The ThinQ sports some highly efficient and capable cameras. The ThinQ sports dual ear cameras that are both 16MP. Though the camera’s hardware in itself is great, the software is noteworthy too. AI is at the centre of the software which enables for 3D stickers and more. Also notable are the various modes in the camera that enhance the photo experience. The front camera is a wide-angle 8MP sensor. The G6’s camera shares few of the same camera specs. The G6 sports dual rear 13MP cameras. Though this is same, all the other software features like the AI integration are missing. The front-facing camera is 5MP. In the camera aspect in the LG G7 ThinQ vs LG G6 battle, the winner is definitely LG G6. The G7 ThinQ is truly a powerful phone. The G7 ThinQ is powered by Qualcomm’s Octa-core Snapdragon 845 SoC. The base variant of the phone comes with 4GB RAM and 64GB of native storage. The storage can be expanded with a memory card. The top tier version of the G7 ThinQ comes with 6GB RAM and 128GB of memory too. The G6, though it had a powerful chipset for its time, does not stand much of a chance right now. The G6 features a quad-core Snapdragon 821 and was coupled with 4GB RAM and 32GB native storage. Though this was a specification that wasn’t bad at the time, it now surely fails to cope up with today’s apps and usage. The G7 runs on Android Oreo 8.0. Though that would mean that the phone uses a lot of Google services, the LG G7 ThinQ takes the Google compatibility to another level with an included button that activates the Google Assistant and Google Lens. This button, located under the volume rocker, activates the Google Assistant in a single press while a double press activates Google Lens. This is the first time that a phone has brought out such a feature. The G6 runs on Android Nougat 7.0 but is scheduled to receive the Android Oreo 8.0 very soon. The phone has no unique feature to activate the Google Assistant or the Google Lens. The design of the LG G7 ThinQ is fluid and gorgeous to look at. A unibody metal design is predominant with the glass covering the rear side of the phone. The G7 is available in Moroccan Blue, Aurora Black, Rasberry Rose and also Platinum Grey. Both the front and back of the phone is protected with Corning Gorilla Glass 5 and is also IP68 certified. The device is completely rugged and can withstand both dust and water. The G7 ThinQ has an added feature called Boombox speaker, a new technology from LG that allows the phone to use its resonance speaker to boost bass performance. The G6 is also not bad when coming to design, though it lacks the bezel-less display. The G6 has a metal and glass sandwich design with a strong metal chassis and glass covering. Though it shares a few design features with the G7 ThinQ, there are some minor letdowns concerning the G6. The LG G7 ThinQ is like no other flagship out there. The phone has all the needed upgrades and features. May it be camera, memory, display or battery life, the G7 ThinQ has got it all covered. 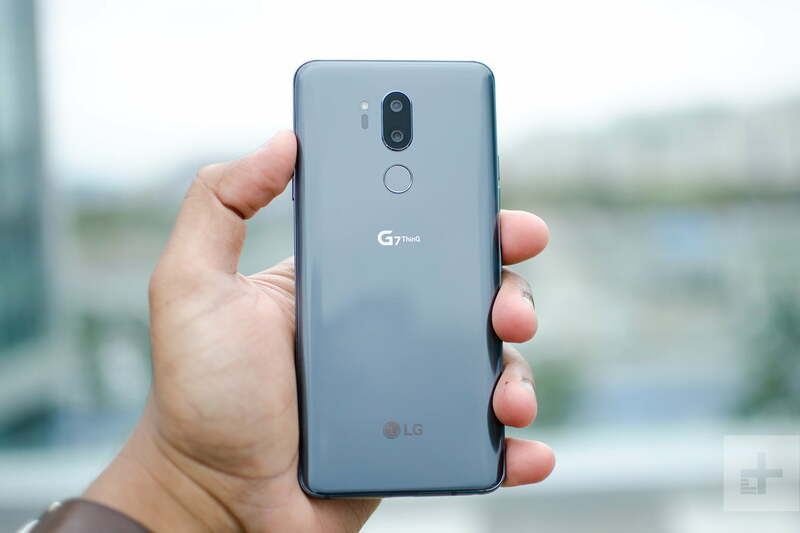 The G7 ThinQ is also the perfect upgrade to the LG 6. When coming to the LG G7 ThinQ vs LG G6 battle, the winner is the LG G7 ThinQ.